-The city of Nagpur in the province of Maharashtra in India is also proudly known as the orange city. 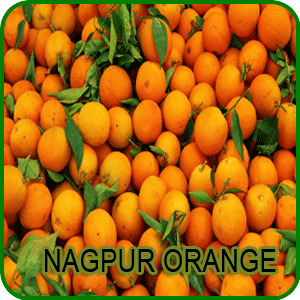 The Nagpur oranges are a wide variety of monsoon fruit which is grown in Nagpur. This countryside rustic fruit which is disfigured with pockmarks gives a tangy sweet taste having a juicy pulp in it. The Nagpur oranges are supposed to be one of the best mandarins across the globe whose production is always showing an upper graph every year. The Nagpur oranges which blossom during the monsoon season goes in for the harvest between February to March. The harvesting period of this mrig crop is so ideal for export since the arrival of the mandarin fruit in the international market is very less during this period. There is also lot of work and effort being put in to make wine from the oranges. The Nagpur oranges also take the credit of being applied for the Geographical Indication with the registrar of GIs in India, which is awaiting its approval. -Oranges which are high in vitamin C and other nutritions are featured with a tangy taste and is one of the most commonly grown trees in the world. In India the growing of this fruit is more concentrated in the Nagpur area which is the third largest city of Maharashtra and is usually the seat of the annual winter session of the Maharashtra State Assembly �Vidhana Sabha�. Nagpur is one of the main centres of commerce for the state. The Nagpur oranges are highly nutritious and are rich in various vitamins like C, A and B. Oranges apart from being eaten fresh it is also consumed in various other forms like juice, squash, jam and syrup. It also has an established role in the commercial and international market like it is one of the main sources of peel oil, citric acid and cosmetics.Though there a lot of varieties of orange grown in India like sweet orange, acid lime, etc., the Nagpur mandarin are supposed to be the best mandarins in the world whose production is increasing every year because of its demand in the international market. -Generally the arrival of the Mandarin fruit in the international market during the period of February to March is very less but fortunately this is the harvest time for the Nagpur oranges thereby creating a great demand in both the local and the global market. The Nagpur Santra (Mandarin) is grown primarily in the Satpura Hills (Vidharba Region) of central India, apart from being grown on the hilly slopes of Darjeeling in West Bengal, Coorg in Karnataka, Orissa, Tripur, Sikkim, Meghalaya, Arunachal Pradesh and Meghlaya. Oranges are a type of berries which are Hysperidium and nearly 40% of these oranges go for cold storage. Across the globe Brazil is the leading producer of oranges and this fruit is referred to as Chinese Apple in many languages. The botanical nomenclature for the Mandarin orange is Citrus reliculata Blanco which takes the pride of being ranked first among all the citrus fruits. -The Nagpur oranges do not require a very high altitude for it is grown even at an elevation of about 1500 mt. Some of the major orange producing areas in India are Maharashtra, Karnataka, West Bengal, Orissa, Assam, Meghalaya, Shillong, Arunachal Pradesh and other North Eastern States. Bihar and Himachal Pradesh are also in trial cultivation of Mandarin fruits. The other countries which are into the production of these mandarin oranges USA, Brazil, Mexico, Spain, Italy, Greece, India, Israel, Argentina, Colombia, Ecuador, Paraguay, Venezuela, Cuba, Turkey, Algeria, Morocco, Egypt, S. Africa, China, Japan and Australia. Mandarin is grown in the tropical / sub-tropical regions 35� N to 35� S of equator. Nagpur oranges are used for producing canned segments, juice, juice concentrate, squash, beverages, jams and marmalades. -Apart from being used in the production of essential oil and pectin it also serves as a basic material for the production of cattle feed, candies and alcohol. Some of the finest Mandarins are grown in Nagpur, Amroati and Wardha districts of Maharahatra, and in the Coorg district of Karnataka. The Nagpur oranges can be grown in frost free tropical and sub tropical areas at an altitude of about 1500 meters above sea level. The Nagpur oranges require a rainfall of about 100-200cm annually and a temperature ranging from 100-350 C which is excellent for cultivation of the crop. Mandarins can be grown in a wide variety of soils but medium or light loamy soils with slightly heavy sub-soil is required and also the best pH range for orange cultivation is a soil with a pH of 6.0-8.0.The orchards are first got ready by ploughing, levelling and then weeding is done. 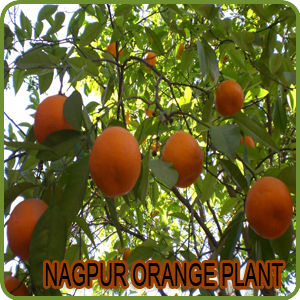 The main means of propagation of the Nagpur oranges is by seeds and also propagated vegetatively by T- Budding. Once the monsoon starts in the month of July- August the orange seedlings are transplanted. Budding of the crop should preferably take place in the last week of January or the first week of February following the shield budding method. Nagpur oranges require lot of irrigation like during the summer period the trees will have to be irrigated once in every 5-7 days whereas during the period of winter the plants are watered once in every 10-15 days. Since these oranges require a very high quantity of water, drip irrigation is also recommended. Oranges are planted in pits of 50 cm. X 50 cm. X 50 cm. size in a square system with a spacing of 4.5-6 m. Along with irrigation foliar spray of the micronutrients are also very important. Trees are trained to single stem with 4-6 well-spaced branches for making the basic framework. -The lowermost branches are not allowed to grow below the height of 50 cm. from the soil surface. Pruning is done during the initial years of planting but once the tree starts to give fruits then pruning is not required. It was only during the early 70's there started a demand for the Nagpur oranges because there were a number of markets in major cities like Howrah, Delhi and Kanpur. Number of orchards came up in the district of Vidarbha. But with this increase in the number of orchards also led to environmental pollution because of bore wells dug everywhere. But however the planters of this fruit also suffered a lot because of natural calamities which is not in their hands. These planters also face difficulties like white- fly epidemic in the orange trees and various other factors like low rainfall, prolonged hot spells, a repeat white-fly attack and plunging water tables brought down the crop cover in Nagpur division from 60,000 hectare (ha) to 30,000 ha. So the agricultural department is recommending the farmers to concentrate more on irrigation and pesticides. -Next only to Nagpur the most well known place for oranges is Jhalawar district which is also popularly known as "Small Nagpur". It ranks second in the production of orange in the country next to Nagpur. Some of the important citrus belt which is known both in the national and the international markets are Bhawani Mandi, Jhalrapatan and Pirawa sub divisions. There are records of the Nagpur oranges production which constitutes about 794 hectares in the year 1984-1985. But however after the establishment of the Directorate of Horticulture at State level, the production has grown with full momentum and the number of hectares producing oranges has increased tremendously. In order to boost up orange production and to provide risk coverage due to scarcity of water during flowering period, an innovative scheme "WEATHER INSURANCE FOR ORANGES" was initiated in the district in year 2004-05. Under this scheme 388 orange growers who took 1702 policies received insurance claim amounting Rs. 19.248 lacs from insurance company. -The State government had subsidized the premium paid by orange grower to the tune of Rs. 4.977 lacs. Next to mango and banana, citrus fruits are the third major fruit industry of the country. India contributes about 3% of the world's total orange production. As mentioned earlier the export market for the Nagpur oranges are quite high for the fact that these oranges are ready for the harvest at the time February-March during which there is very less of arrival of the oranges from the rest of the world in the international market. The export of Nagpur oranges can be increased even to a greater extent when careful handling of the post harvest techniques is followed so that the quality and the freshness of the fruit is retained for a long shelf life. -Apart from the fruit consignments to the neighboring countries of Bangladesh and Nepal by road, the Nagpur oranges are also exported to other countries like Europe, Gulf and South East Asia by refrigerated container both in ships and by flight. Some of the other international market for the Nagpur oranges are Sri Lanka, Canada, U.S.A., U.K., Germany and Gulf countries like Saudi Arabia, U.A.E., Qatar, Bahrain, Kuwait and Oman. The producers get much better prices when they sell their fruits in the local market meant for it than selling it in the orchards itself. However the market cost also includes transportation cost of fruits and payment to commission agents. The Nagpur orange producers do have Producer's organizations and co-operative societies which assists the producers in channeling the markets and thereby helping the mandarin growers. Crop insurance policy is also available for the growers along with advanced marketing credit/loan facilities.